Everyone I know has a junk drawer. Some look junkier than others! 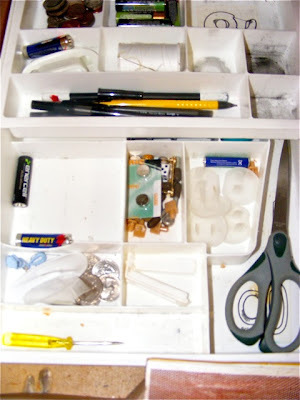 Several years ago when our junk drawer had gotten out of control, I decided I needed to tame the junk monster. So, I started searching online for an inexpensive option and found this. Now my junk drawer is under control, and things are easy to find (if my girls would just stop stealing my tape!!). My junk drawer organizer works for me! Visit We Are That Family for more great tips and ideas! If you can find a spot top secret enough, let me know! !